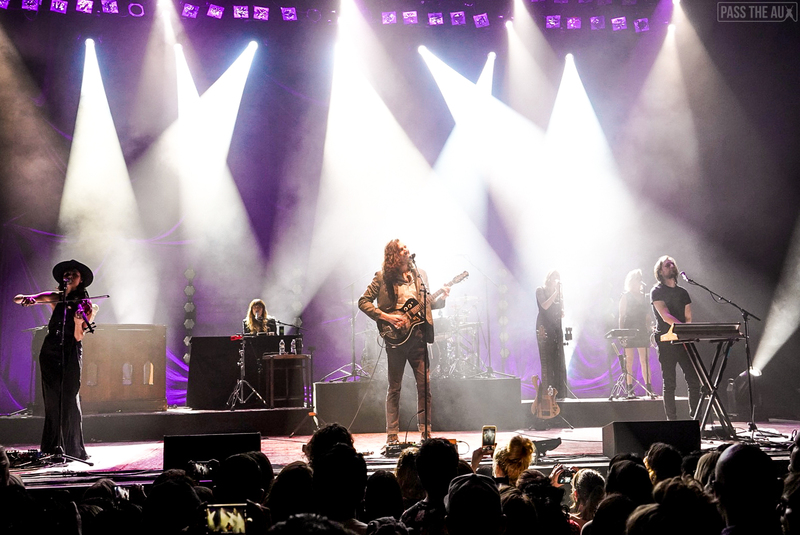 Bluesy Irish singer-song writer Andrew Hozier-Byrnes, better known to the world as simply Hozier, packed The Wiltern for not just one, but three consecutive sold out nights. 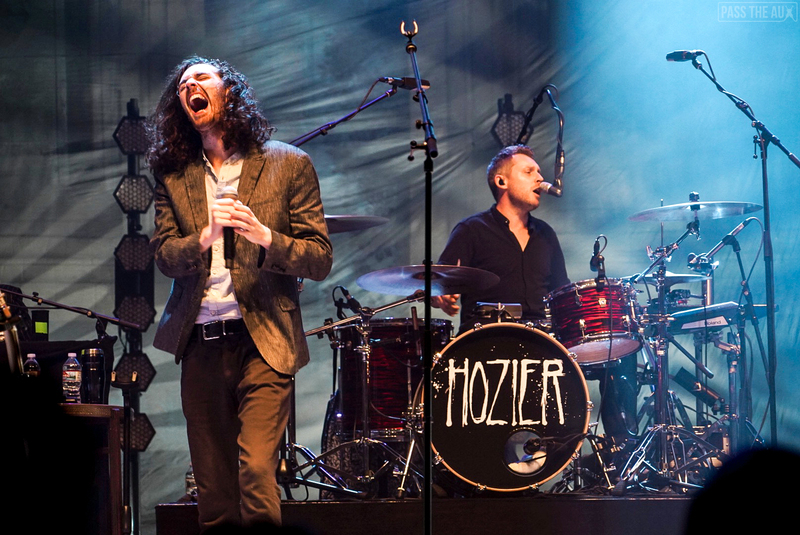 It’s been four years since Hozier put out his debut eponymous record, which makes the three consecutive sellouts all the more impressive. This past September, he made a triumphant return with a four track EP titled Nina Cried Power and it is GOOD! After hearing just the four songs off the EP, I can’t wait to hear what else he has in store for us. Luckily the wait won’t be too long, as a full length album is set to be released early in the new year. Eager fans formed lines around the historic venue hours before showtime. 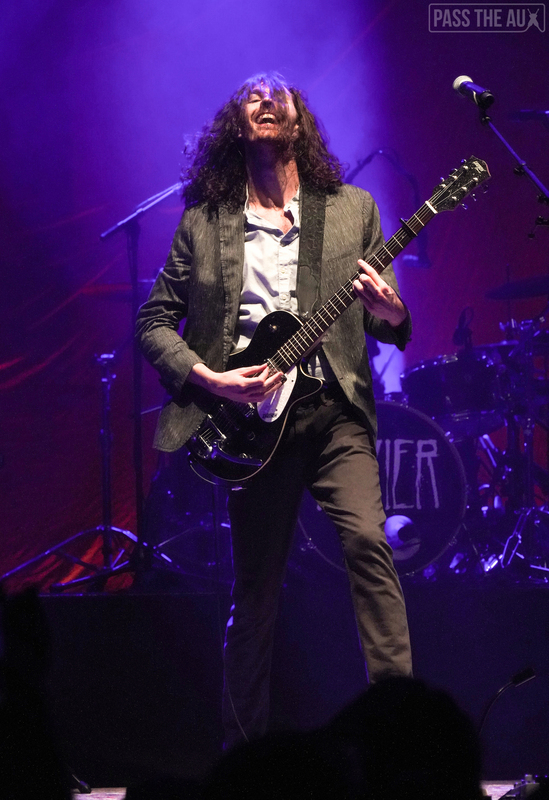 Evidently, they were craving to hear that big brooding voice live and to watch those envious worthy, curly locks of his, whip around on stage. 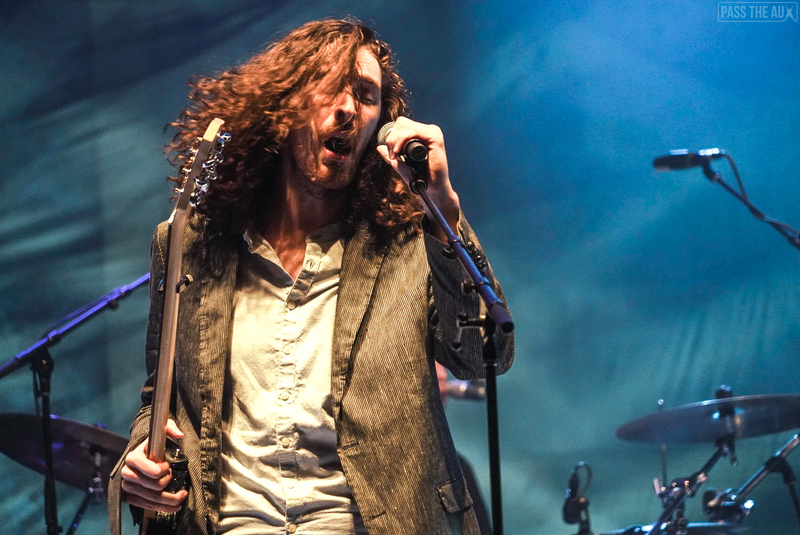 Hozier came prepared to satisfy his fans. 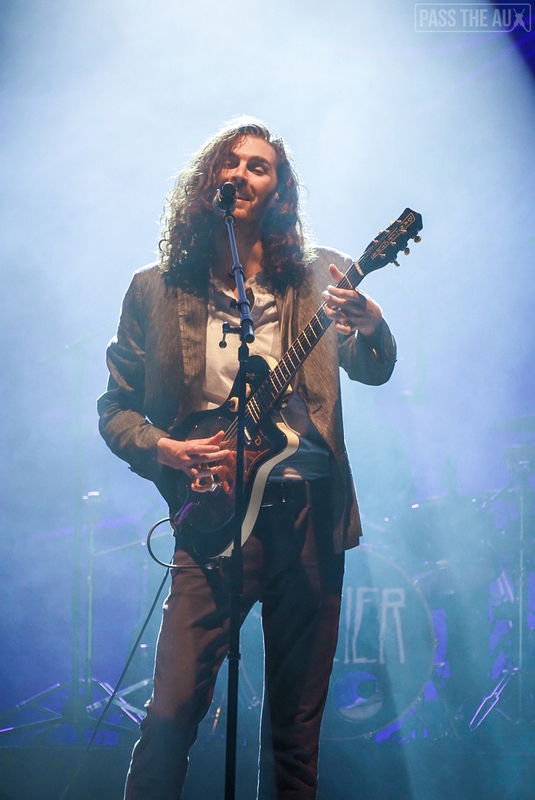 For those who are only familiar with Hozier from the unlikely mega smash hit “Take Me to Church”, please be advised, there’s much more to him than that one marvelously impassioned anthem. He is not just another one hit wonder by any means. 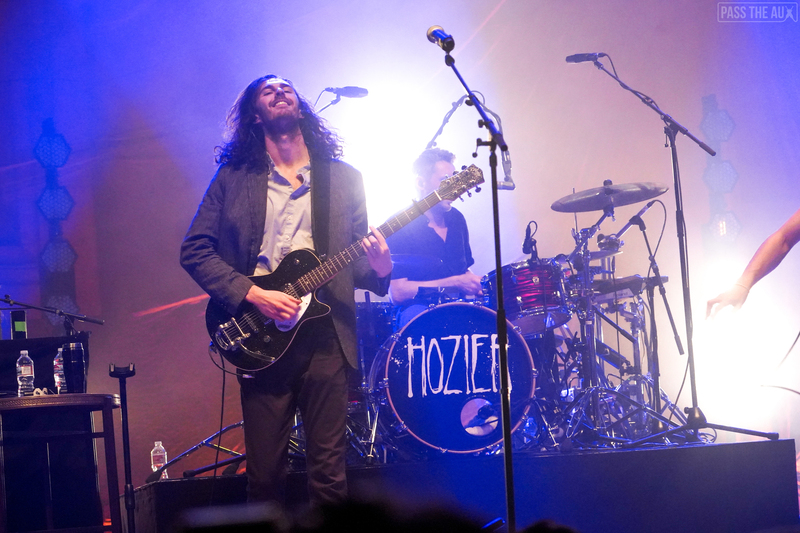 His richly textured, soulful voice and bluesy musical style may not fit the industry’s mold for continued chart topping success, but it’s been enough to gain a committed fan base who appreciate the earnest talent that Hozier possesses. And they came out in droves to support him. Opening the night was Irish folk duo, Hudson Taylor. 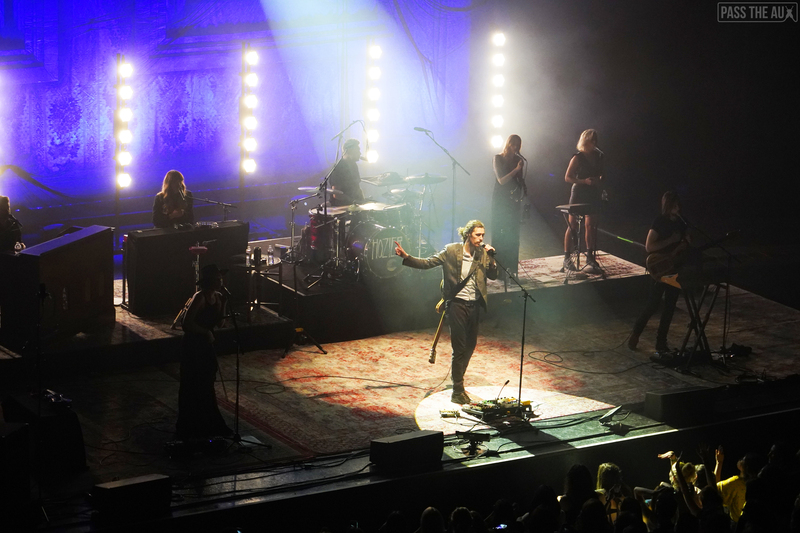 The duo consists of Harry and Alfie Hudson-Taylor. The brothers from Dublin and their band, were a perfect fit to get the night going. 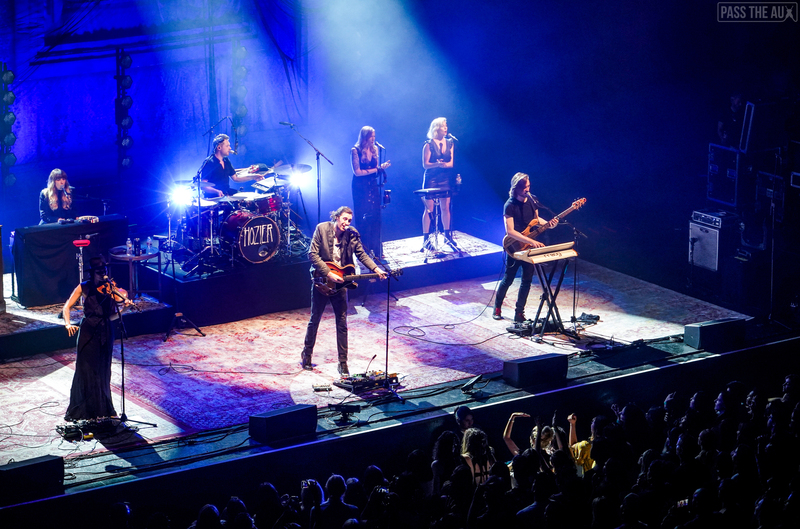 The crowd was loving their folk-infused, melodic pop and upbeat vibes, dancing and clapping right along. Their band was massive and multi-talented. 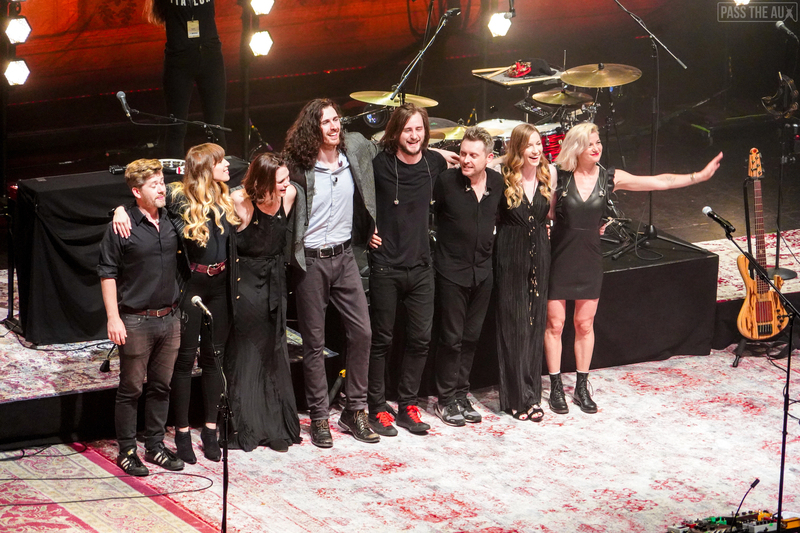 There were breakdowns that featured guitars, flutes, harmonicas, tambourines, violins — you name it, this band was doing it! 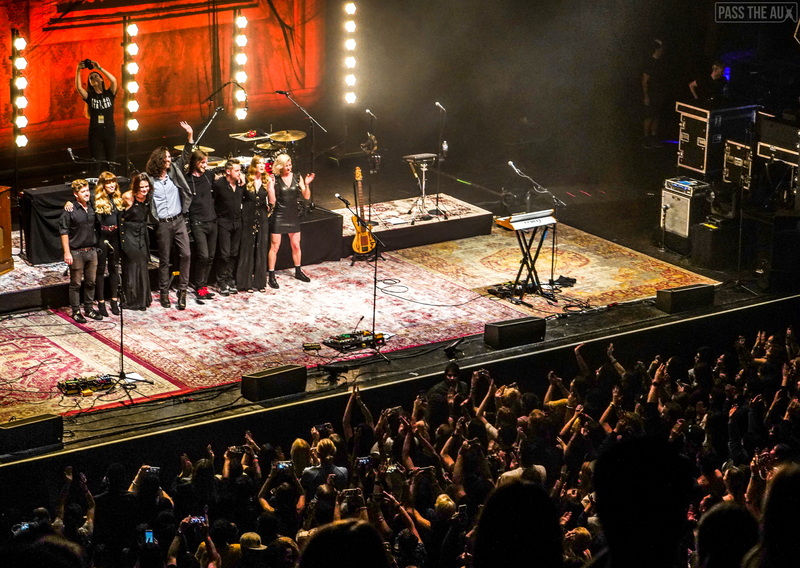 It was like watching a huge party go down on stage, as if The Wiltern had suddenly transformed into one big Irish pub where everyone was cheering and dancing the night away. I had never heard of Hudson Taylor before but after catching them live, they’re on my radar. 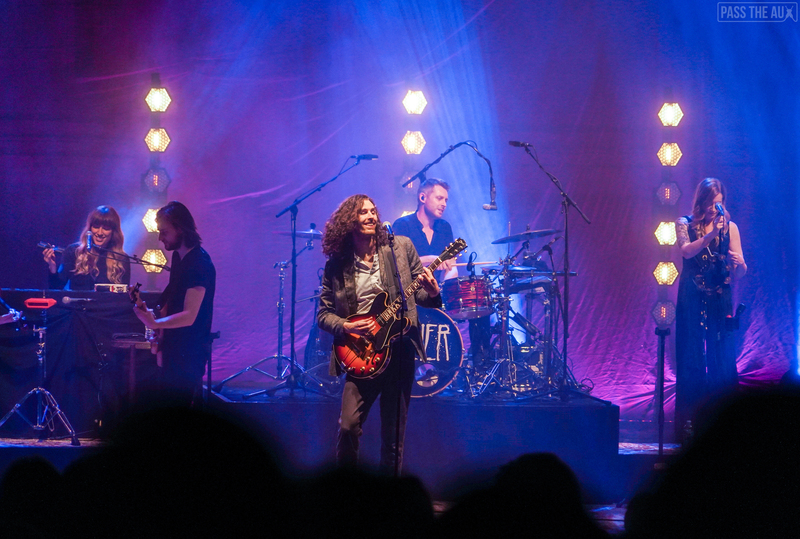 They have so much heart and soul in their songs, it’s a real feel-good time when they’re on stage. I have no doubt this duo will be getting many more opportunities like this coming their way in the future. Next up, the opening drum beats to “Nina Cried Power”, the title track and lead single from the new EP, electrified the audience. The opening line “It’s not the waking, it’s the rising” instantly captivates your ears, letting you know you’re about to hear something powerful. If there were to be a follow up song to take on the rousing success of “Take Me to Church”, “Nina Cried Power” is that song. It’s a classic look on protest songs and pays tribute to many of the great freedom fighting singers of the past, including Marvin Gaye, B.B. King, Joni Mitchell, Billie Holiday, Bob Dylan, Mavis Staples (who actually lends her vocals on the recording of the song) and of course, Nina Simone, whom the track is endearingly named after. 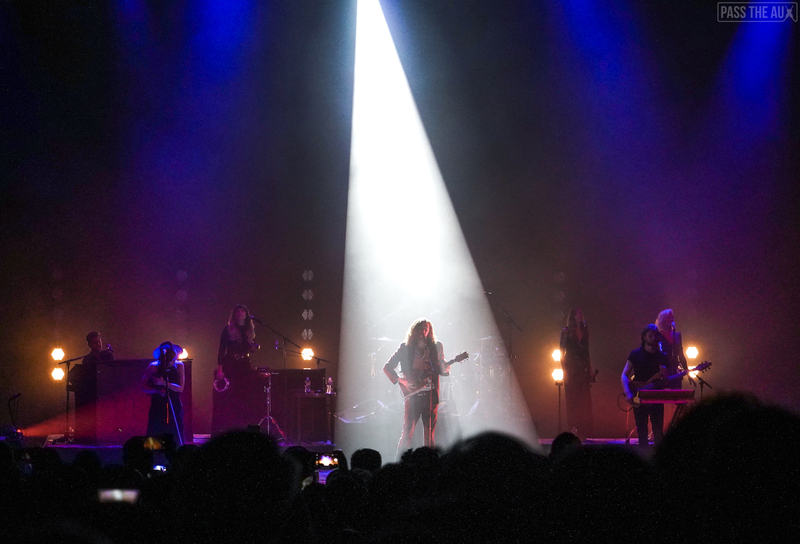 The song has the ultimate praise chorus, as Hozier belts out loud and hard, “And I could cry power” then yells out the aforementioned artists’ names followed by ‘…cried power.’ It’s been a long time since I actually went to church, but Hozier made me want to scream out a ‘Hallelujah, Praise Jesus’ after that number. Damn, what a powerful and raw performance for only the second song in! I knew the rest of the show would not disappoint if it started off on this high of a note. “Jackie and Wilson” was another nod to another great in R&B singer Jackie Wilson, who was known as being a prominent figure in the transition of rhythm and blues into soul. 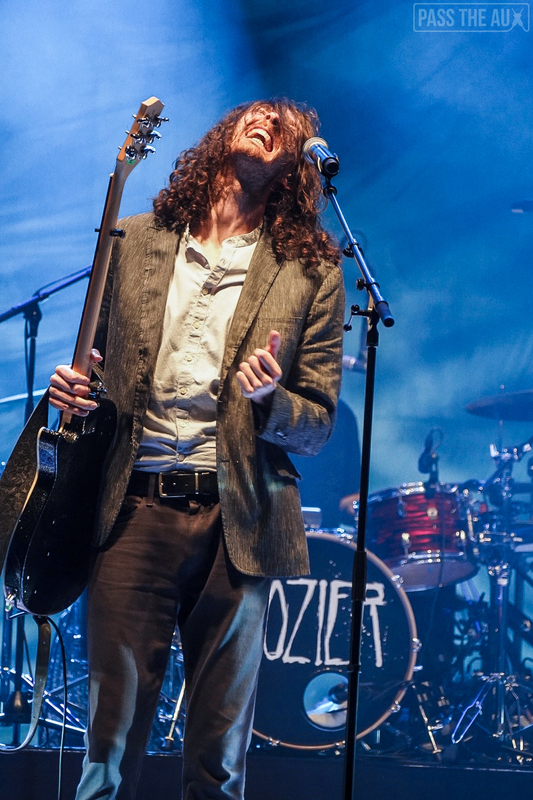 Clearly Hozier has a wide range of old school influences and is happy to educate the younger generation of these legends through his gracious lyrics. The ending line of the chorus “We’ll name our children Jackie and Wilson, Raise ‘em on rhythm and blues” is such a cheerful lyric, it’s hard not to smile when hearing the words. I also have to mention the brilliant female back up singers, who added angelic and wonderful choir -like harmonies to the performance. The song was most definitely a crowd pleaser. 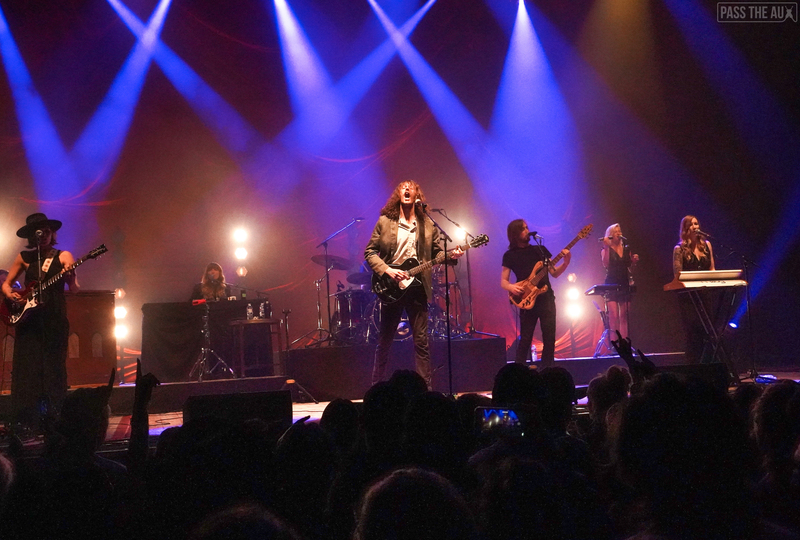 Hozier performed a number of fan favorites, including “Angel of Small Death”, “Codeine Scene”, “From Eden” and “Arsonist’s Lullabye”. 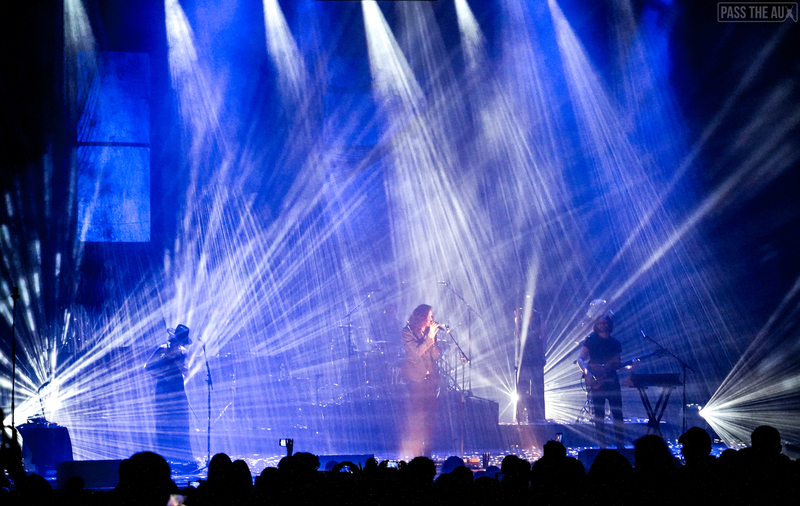 The crowd was given a visual treat with the performance of “To Be Alone”. 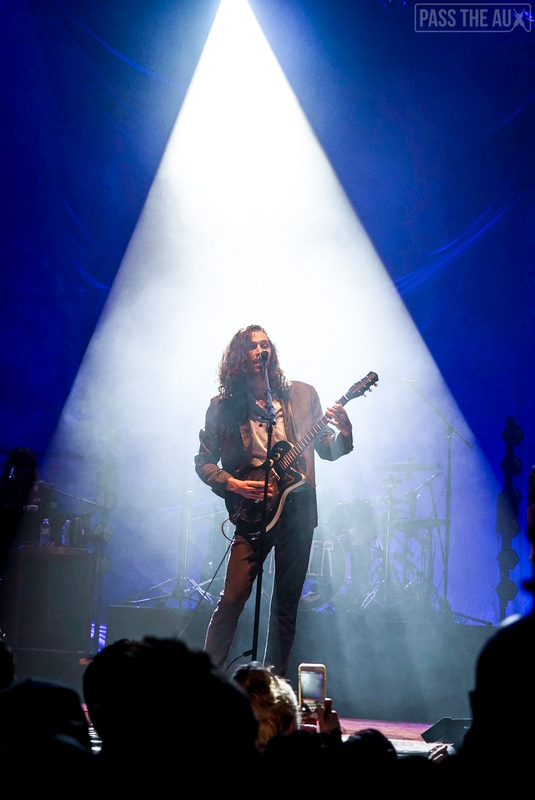 As Hozier sang with his guitar in hand, his shadow was largely illuminated on the side walls of the venue, making the moment feel surreal. 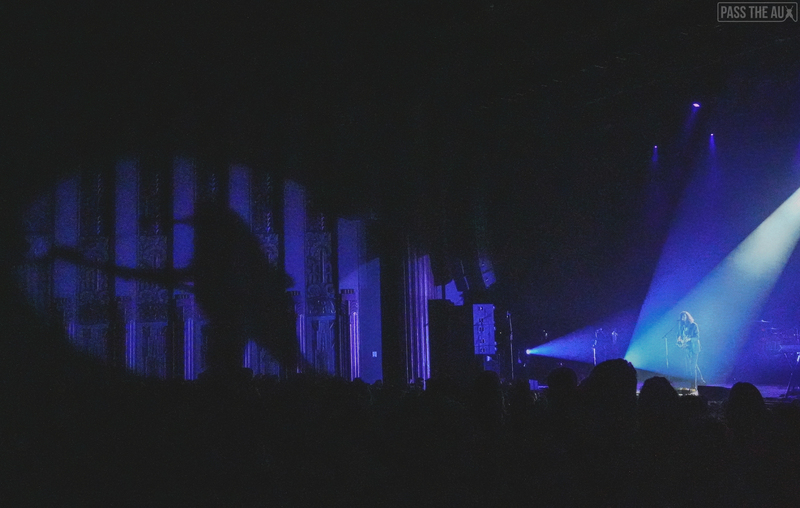 Everyone reached for their phones, to capture a clip of this magnificent view — Hozier and his shadow, rocking the house down. 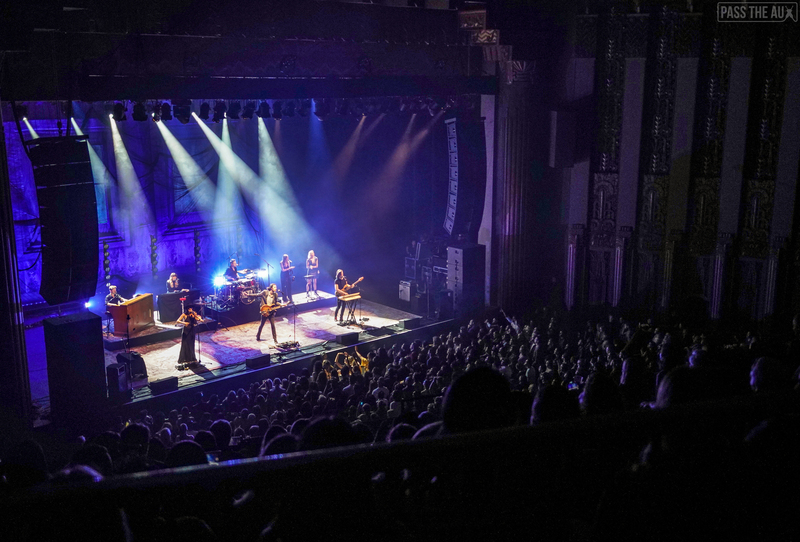 “It feels good, God it feels good to be alone with you,’” Hozier sang out to the crowd and in that moment, he was truly making it feel like you were alone with him. 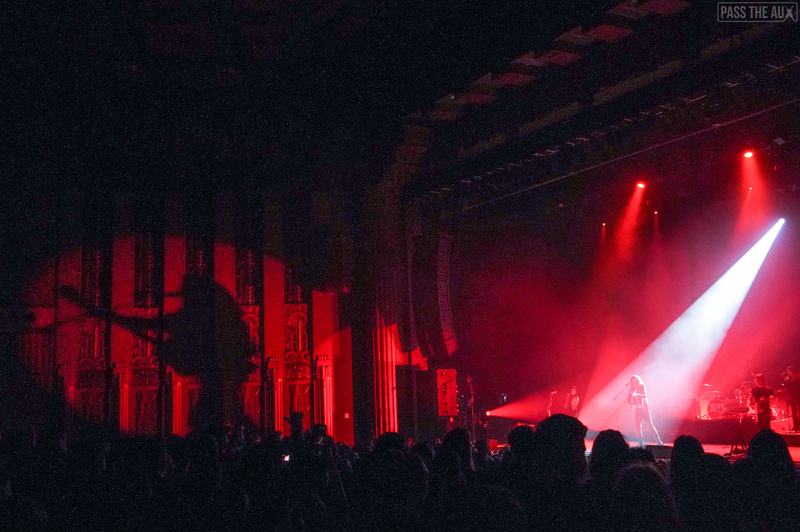 The lighting crew for this show have to be mentioned because it was one of the most visually stunning shows I’ve ever seen at The Wiltern. Absolutley beautiful. 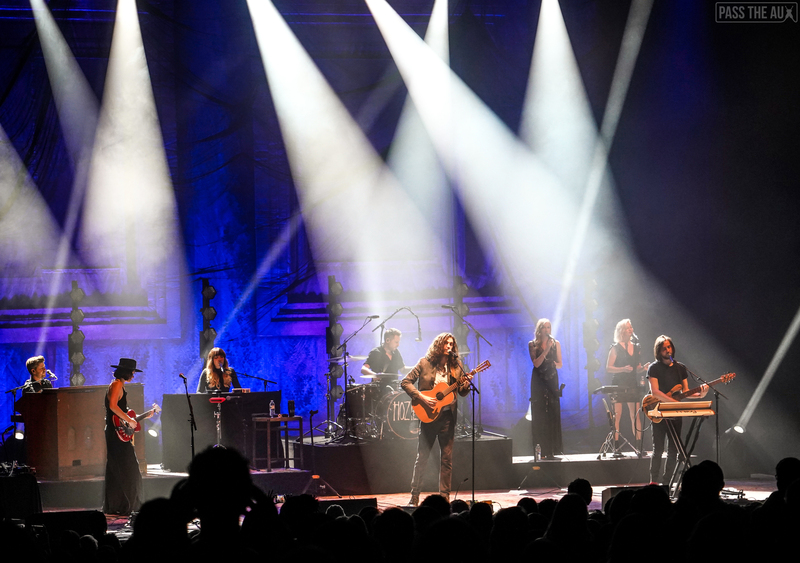 For the emotionally powerful song, “Cherry Wine”, which tackles the topic of domestic abuse, Hozier took the stage solo, for an intimate acoustic performance. 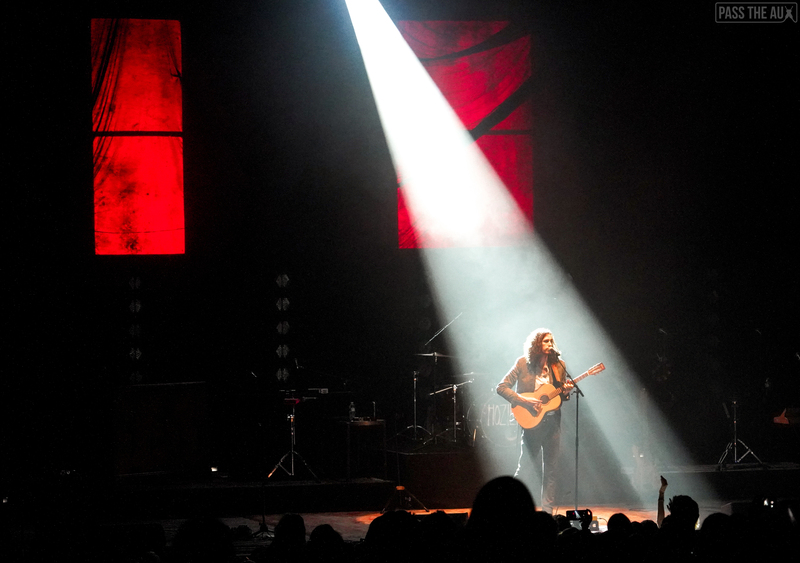 He stood in a beautifully framed spotlight in the center of the stage, and sang with his heart on his sleeve. It was such a beautiful, delicate moment. At times, I couldn’t help but to visualize the powerful video that was produced for this song, featuring actress Saoirse Ronan, where she stares at herself in a mirror, slowly uncovering her battered black eye. I’m not going to lie, I may have cried a little during this performance. Much like the video, the subtlety of the performance made the message even more meaningful. 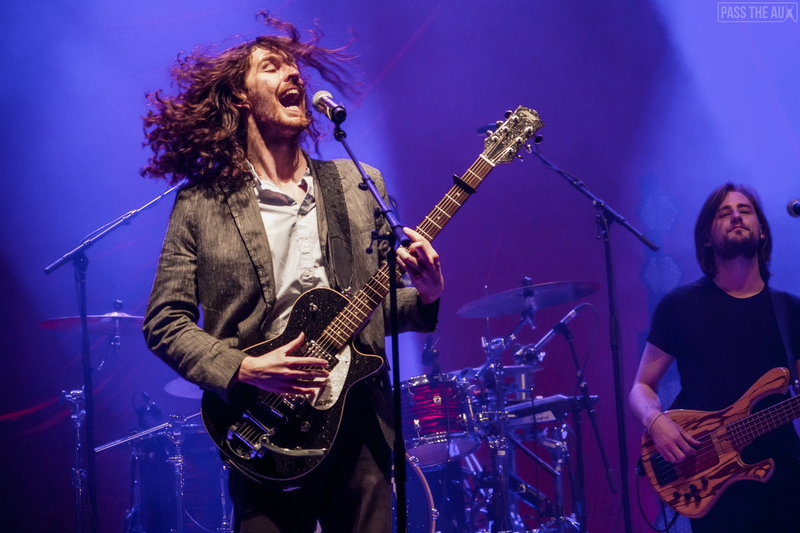 Hozier endorsed the song as part of the #FaceUpToDomesticViolence” campaign, to shine light on the issue and complexity of domestic abuse and to raise money for different charities. Could this Irish man be more sensitive and loveable? The performance of this song was definitely a highlight of the set. 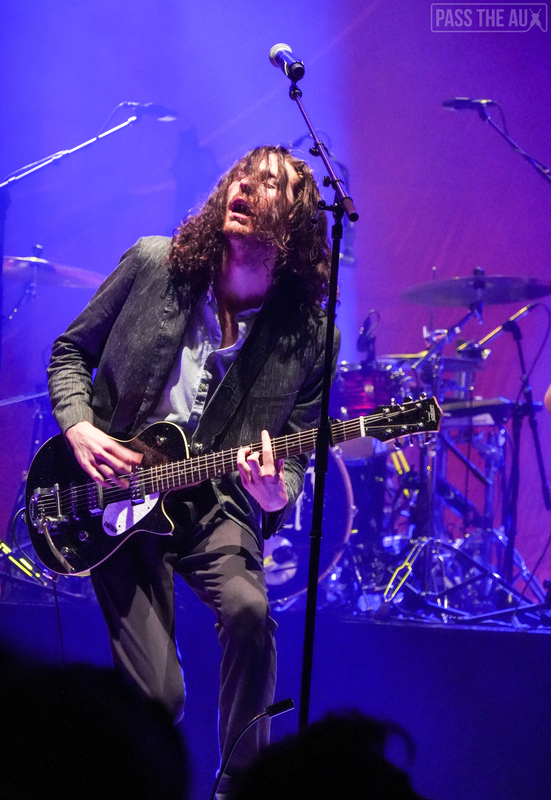 Hozier played the rest of the tracks from his new EP and the fans delighted in hearing them. “NFWMB” (’Nothing Fucks With My Baby’), which he described as a love song for the end of the world. The somber tone and slow pace of the song, still made clear loudly to the audience that his ‘baby’ cannot be messed with. How chivalrous. “Moment’s Silence (Common Tongue)” is a more upbeat track, that one might even find themselves dancing to. It has a catchy chorus, great guitar riffs and echoing claps that keep the beat throughout the entire song. 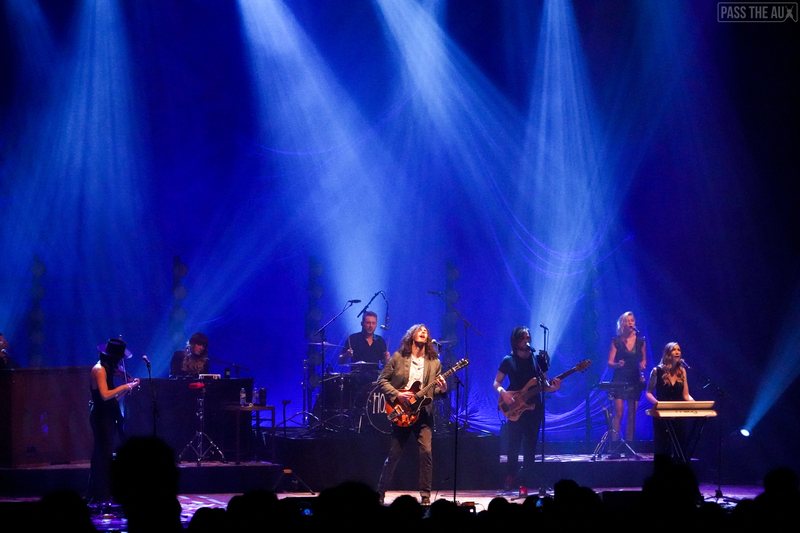 The crowd was swaying and clapping along. “Shrike”, is easily one of the most beautiful songs I’ve heard this year, sung with such a pure and genuine sincerity. The sweet low hum of the song has a delicate sound similar to “Cherry Wine”, and instantly has you feeling all the feels. 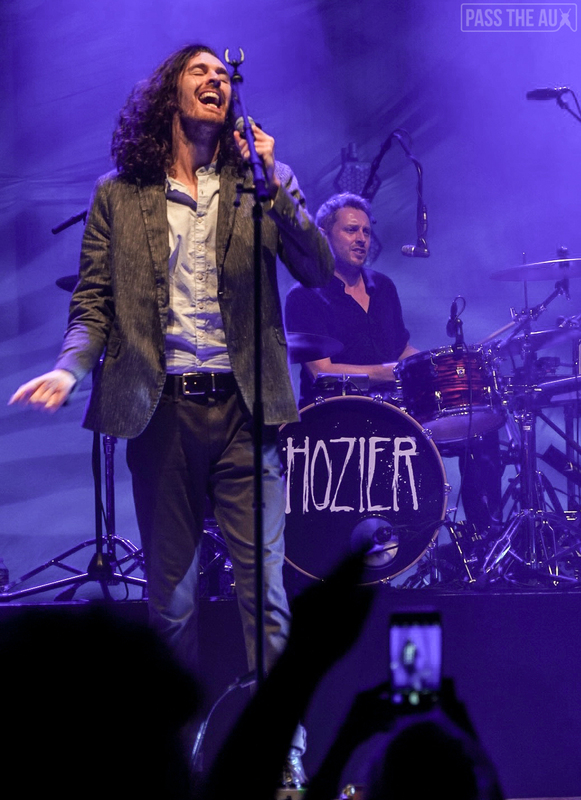 Like many of Hozier’s songs, it sings of a love gone wrong, in this case he is singing about an ended relationship with the person he was (and appears to still be) in love with and expressing his regrets for the things he couldn’t do when they were together. And realizing it’s too late now. In the chorus he sings out to his lover to remember him as “a shrike to your sharp and glorious thorn.” I had to know what a shrike was when I first heard this hauntingly, gorgeous song, I wasn’t sure if it was an Irish expression I was unfamiliar with…but no, a shrike is a bird that is known for impaling it’s prey on thorns after killing it with it’s beak. Yikes, gruesome. Yet the metaphor is oddly sweet. Owning that he hurt his love and wanting her to remember him in her journey finding peace. Or at least that’s how I interpreted it. Even if it’s just actually about a bird, the song is damn touching. The fans in attendance also got a sneak preview of a yet to be released song. 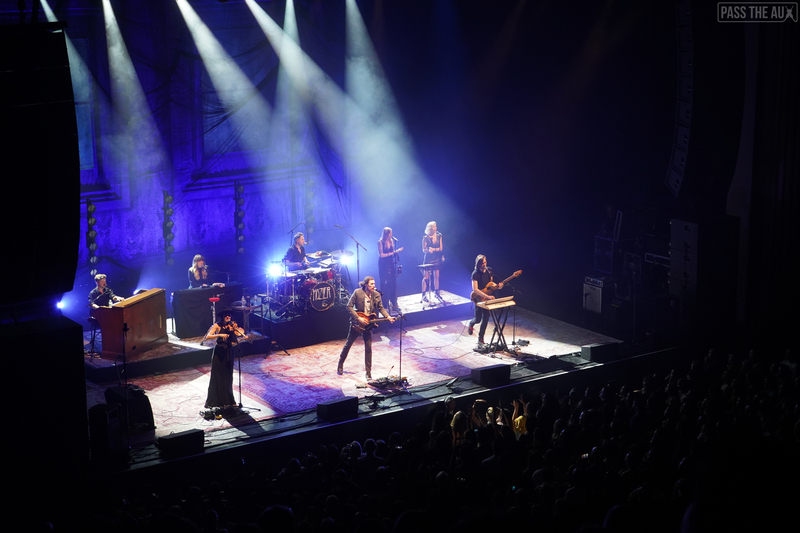 Hozier told the crowd, “You are one of the very few audiences to hear this song and it’s one of my favorites off the record which will be out early next year. 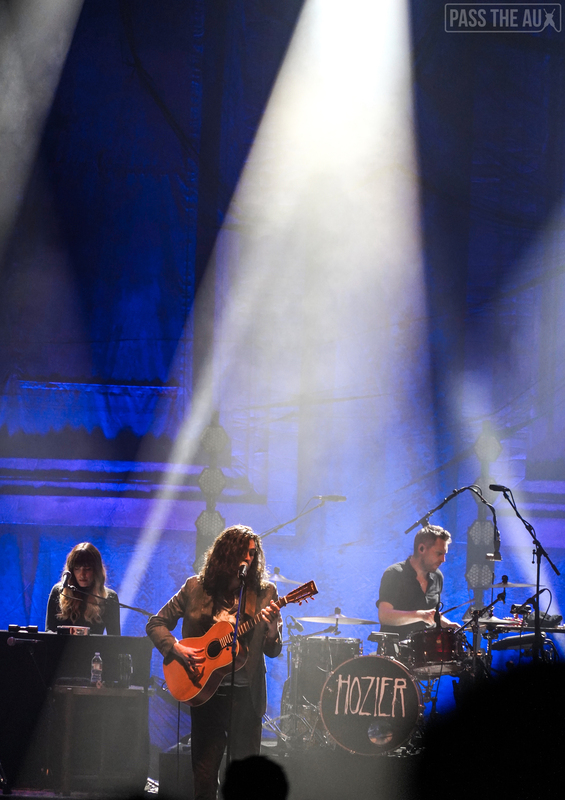 It’s called ‘Movement’.” It was a wonderful moody ballad, with powerful back up vocals that bring the song to life. I can’t wait to hear how this one sounds recorded. 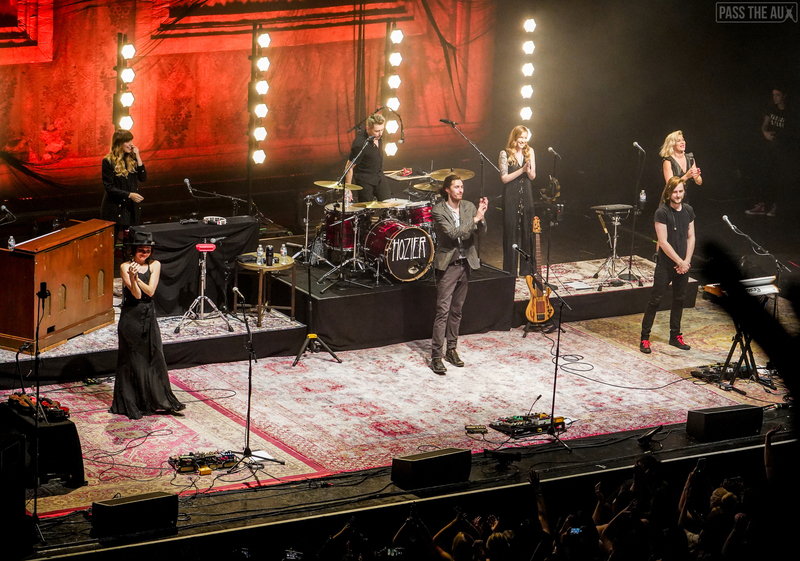 Hozier finished his pre-encore set with the well known masterpiece, “Take Me To Church”. I have to be cliche and say that seeing this song performed live, felt like a spiritual experience. 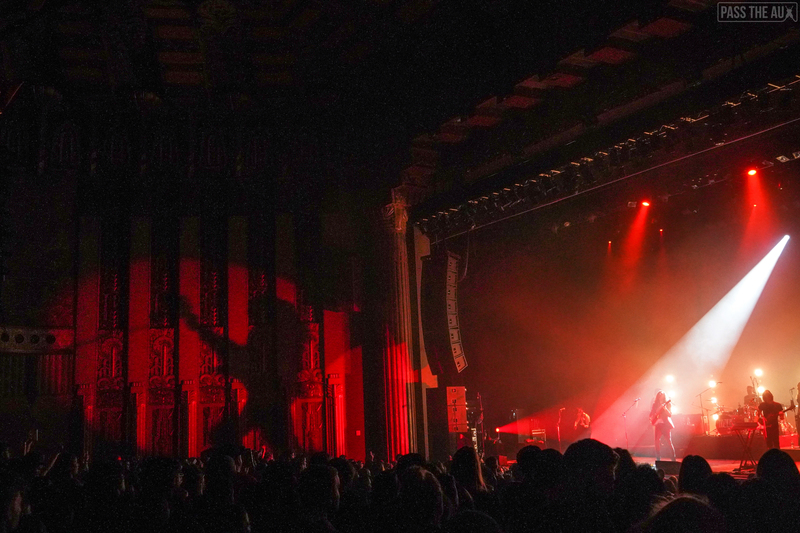 Everyone was waving their hands in the air, singing along enthusiastically. It’s been four years since it was at the top of the charts but hearing it live, it totally makes sense why it turned into the monster that it became. It’s a song with a strong message about the hypocrisy of religion. The music video for the song features a narrative based on the Catholic Church’s shaming of homosexuality. 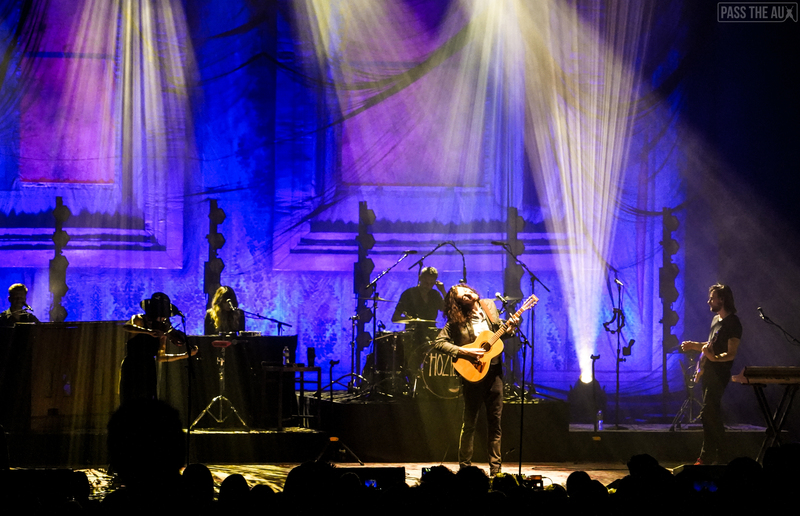 Another powerful and moving message the singer brought to life through his glorious talents, visually and lyrically. Seriously, can we all just applaud him over and over again? I can’t think of any musician who shows more humanist (and feminist) sentiment through their lyrics. 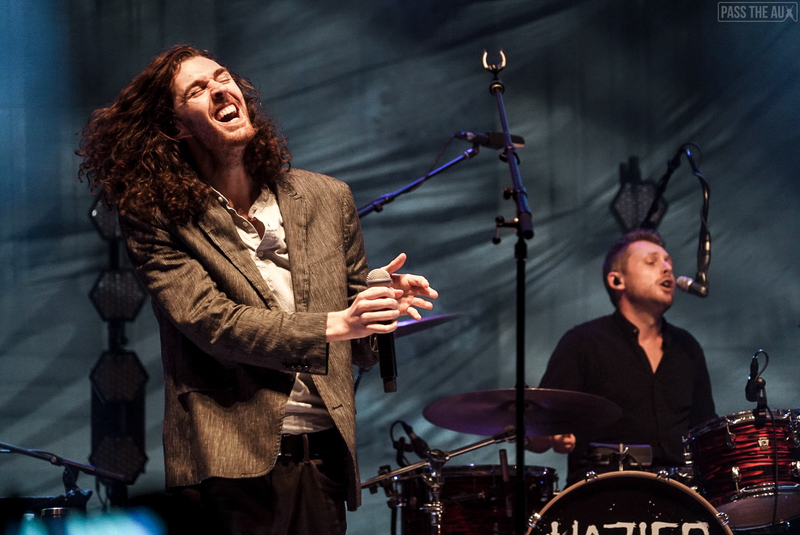 Hozier is a musical poet. 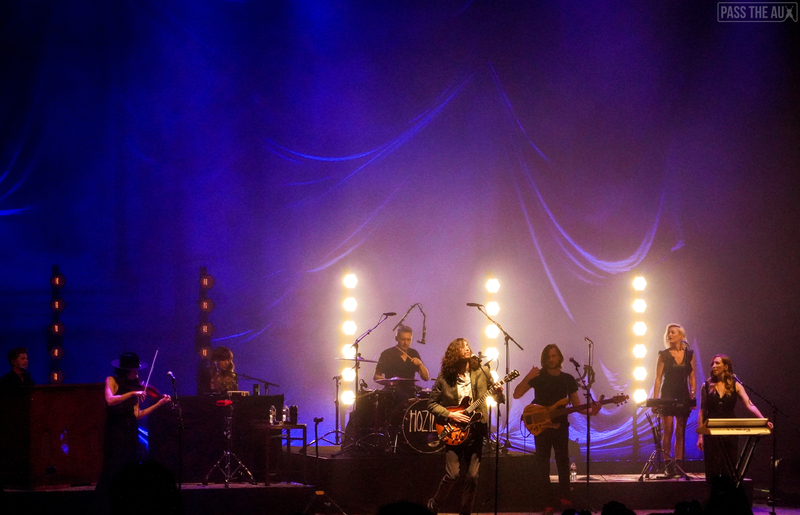 Hozier took a quick break before returning the stage for a two song encore. He did an impressive cover of Destiny’s Child classic Say My Name that would make Queen Bey proud. It was so good! 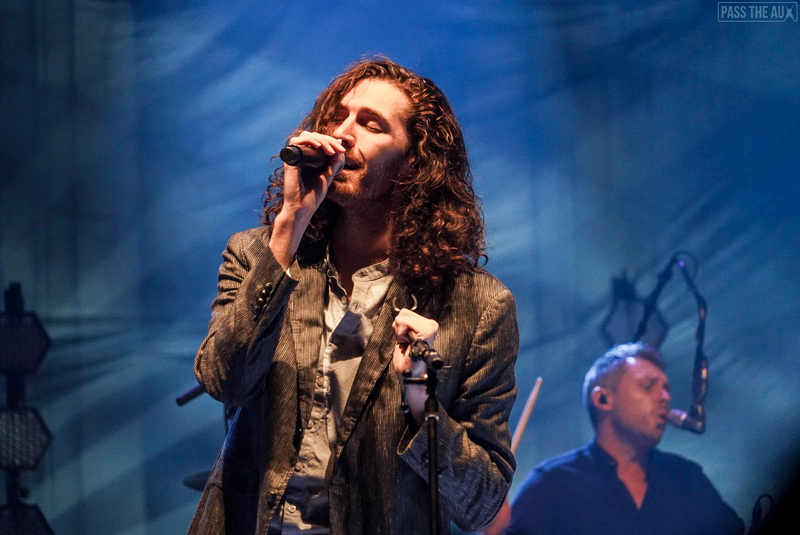 It showcased the vocal talents of his backing singers and turned the pop song into a full on R&B blues jam. 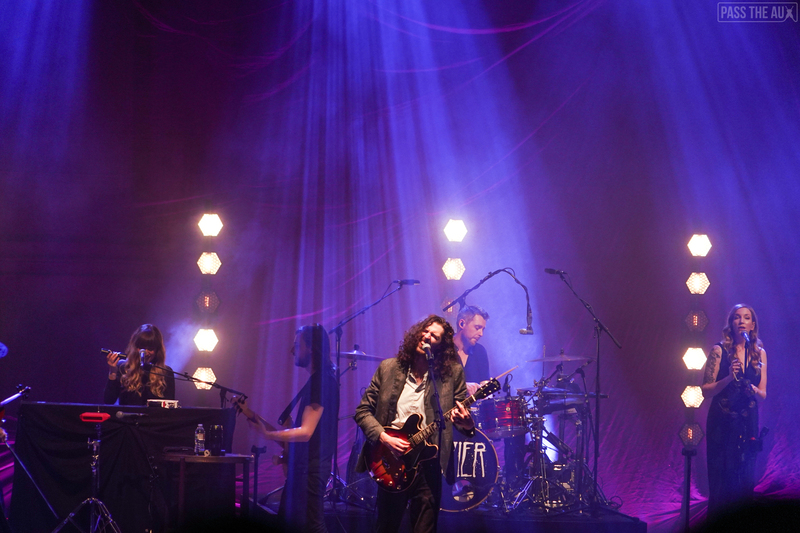 For the final song, Hozier ended the night with Work Song. God, that is a good song. 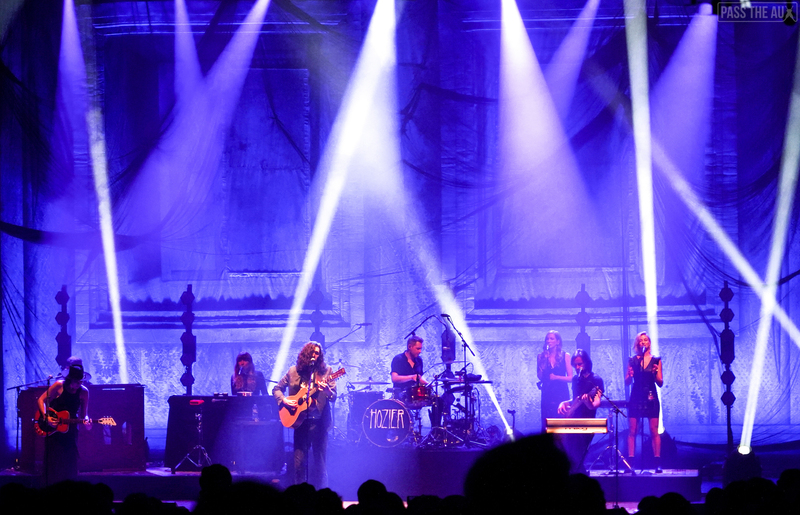 Hozier sings “When my time comes around, Lay me gently in the cold dark earth. No grave can hold my body down, I’ll crawl home to her”. Those lyrics are so piercing. It was a great song to finish the amazing 90 minute set with. 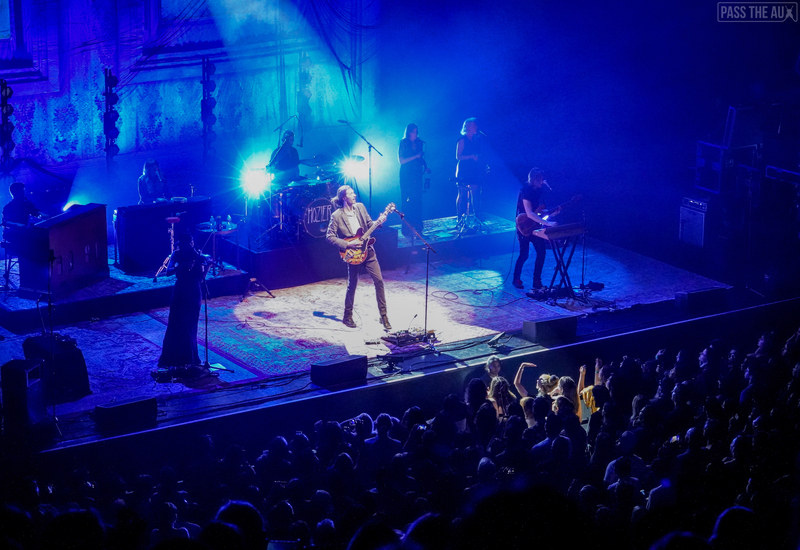 Hozier put on a spectacular show and his new album is sure to meet and surpass our expectations.